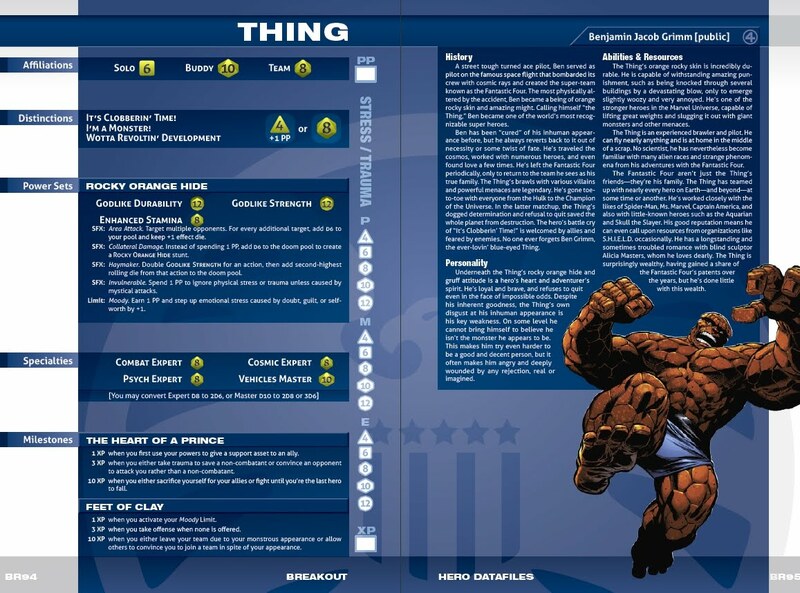 I had a whole mini-thesis written in rough about superhero games, but we'll leave that for now... One of the biggest pieces of news this week on DriveThru and RPGNow was the launch of Margaret Weis's Marvel Heroic Roleplaying Basic Game. In summary, it's beautifully presented, lots of graphic novel art. System: plot points and dice pooling will appeal to modern players - it looks pretty fast play, if you remember the right fomulas for mixing up the abilities dice - some help is provided by a couple of handy prompt sheets. There's plenty of the more popular heroes to choose from, but being a basic game, there's not much in the way of adversaries beyond the scenario included - so curious referees will feel obliged to buy more material pretty quickly. I like the fact that the hero stat cards are also provided in a grey format which may hurt colour printers a little less than the high contrast glossy colours of the manual.